09.30: Guess Who’s Coming to Dinner? Its Mike Wazowski from Monster’s Inc. bringing dinner and a movie straight to your home. 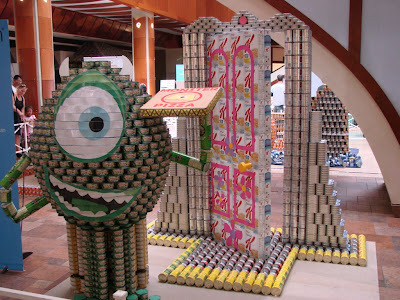 Feast upon his monster-made gourmet pizza in this structure made with tuna, sardines, chili, sweet peas and mandarin orange cans. This design was created by InSynergy Engineering, Inc. I like how the found a good way to incorporate one of the “doors” into this project. We finish our series tomorrow with a look at what the kids built. Check out the display for yourself at Pearlridge uptown through October 9, 2011. 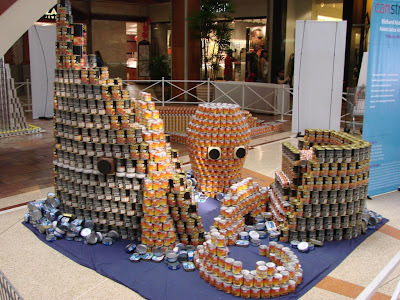 Another great display is “Release the KraCAN” created by Richard Matsunaga and Associates Architects, Inc. Based on the movie Clash of the Titan’s they want to stop hunger from sinking our ship. You have to take a few steps back to take in the whole display and the power of the Kraken. This is another of my favorite displays this year. 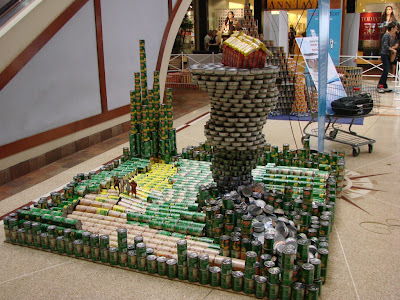 Here is a display by Bowers + Kubota Consulting for CANStruction 2011. It actually took me a moment to see this in all its details. Inspired by The Wizard of Oz just as Dorothy struggles to find her way home many families in Hawaii struggle to find way to feed themselves but by working together we can end hunger. On the right side you can see the destruction by the tornado and of course the house on top of it. The right side shows the famous yellow brick road with the Emerald City in the background. This was really creative and one of my favorite displays.